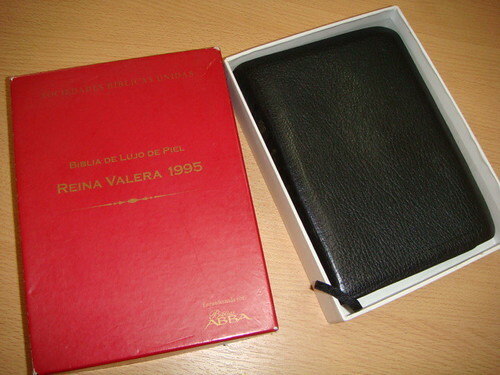 This Bible was published by the United Bible Societies, and uses the Reina Valera 1995 revision. 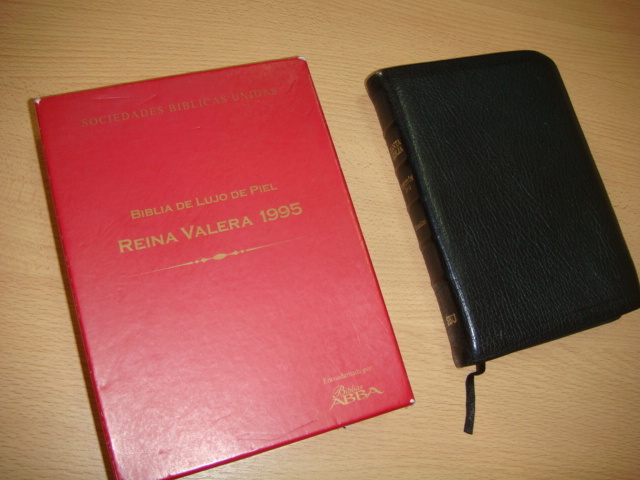 (The Reina Valera is the most popular Bible in the Spanish speaking world, equivalent to the King James Version -- and I think it was translated into Spanish at the same in history time that the KJV was made). 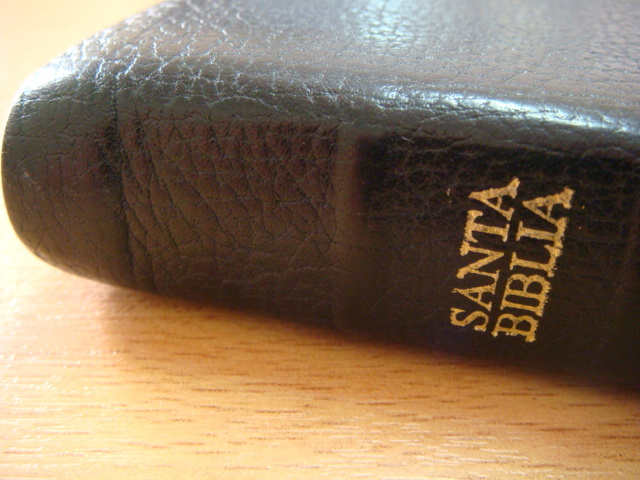 I have four copies of this Bible. One in blue, two in black, and one in tan (that I gave to my wife as a gift). 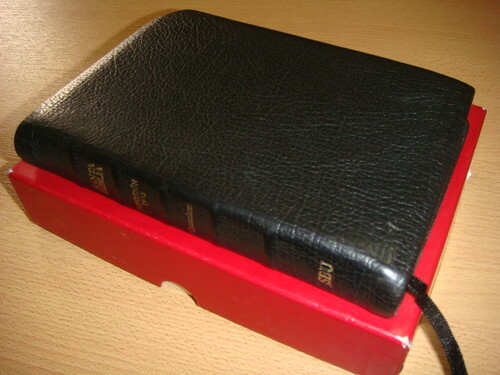 The one pictured here is Smyth-sewn and bound in blue calfskin with leather linings, red under gold page edges, one ribbon marker. 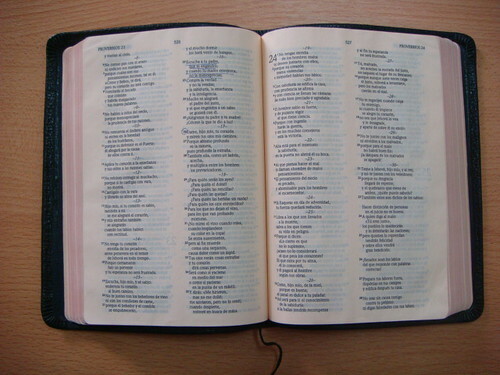 Above: This photo gives a good idea of the Bible's size. 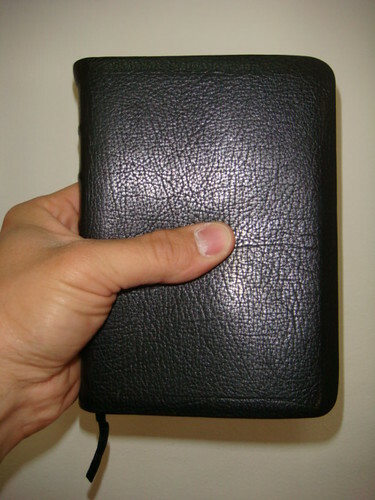 Above: Pictured with the red box. 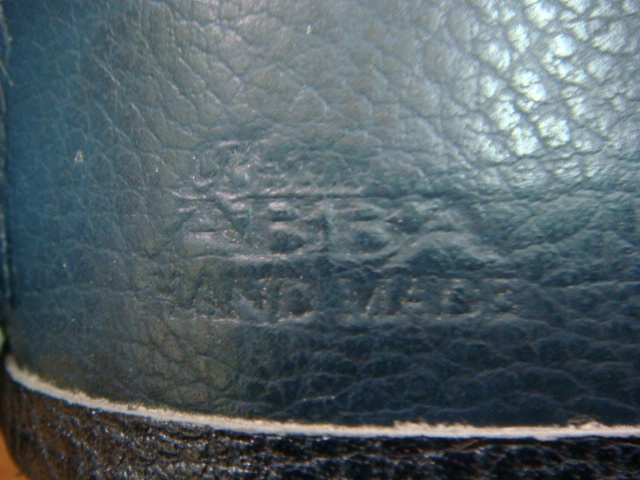 Above: A detail from the box. 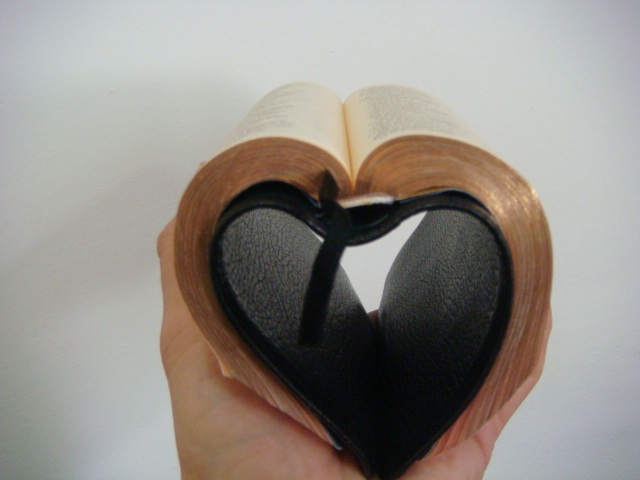 Above: Nestled inside. It's always a good idea to keep the original box handy for storage. 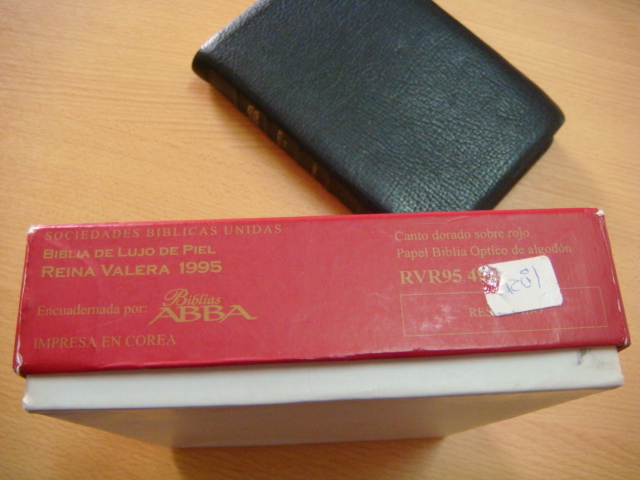 Above: My Spanish is lamentably poor, so please chime in to correct any mistakes, but here's what I take away from the listing: the text block is printed in Korea, bound in calfskin by Biblias Abba, with red under gold page edges. 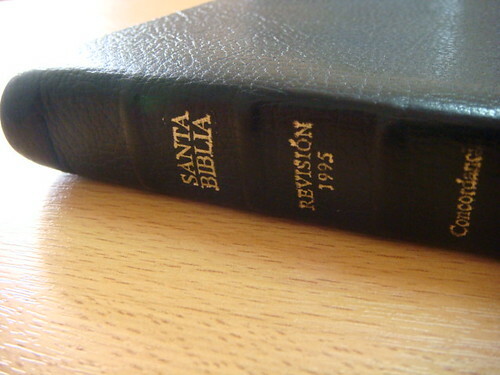 Is "Papel Biblia Optico de algodon" a reference to the paper? 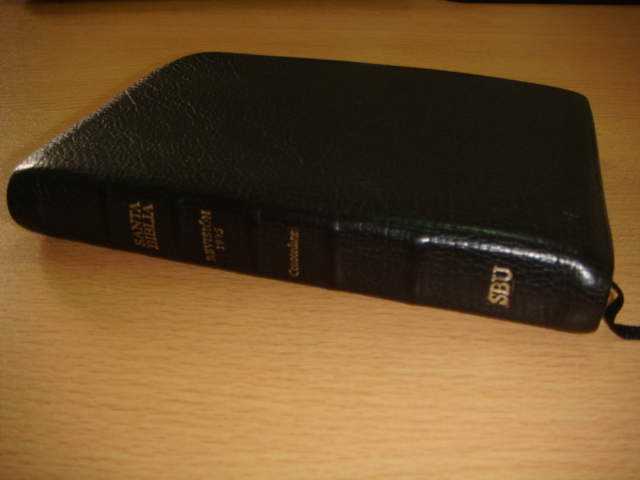 Above: The Bible side-by-side with the box. 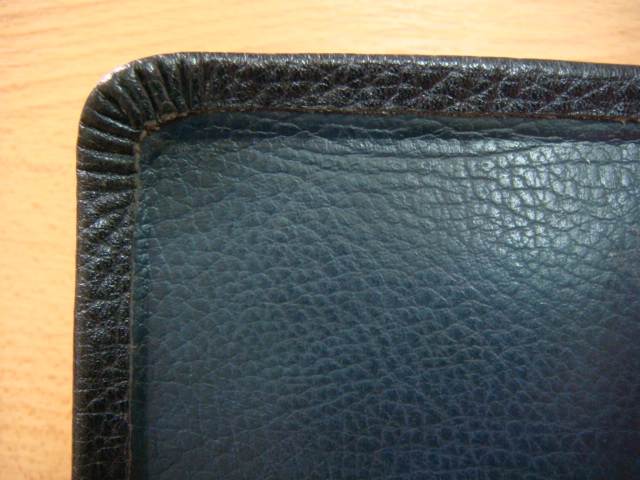 Above: A good look at the calfskin grain. Above: The semi-yapp edge, with art-gilt (red under gold) edges just visible. Above: Flexible much? I'd say so. 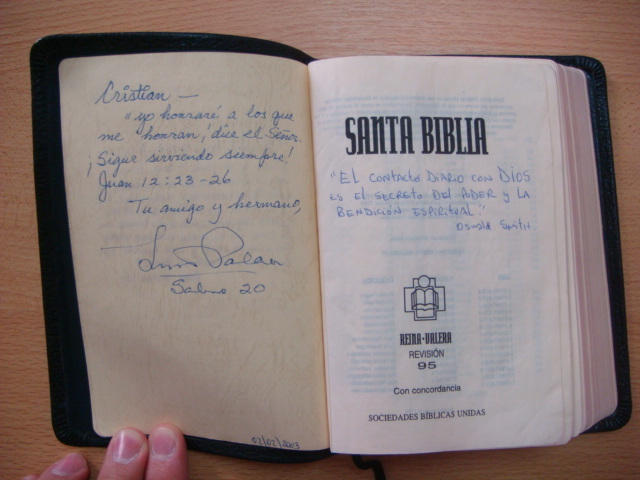 Above: Cristian works with the Luis Palau Association, and as you can see, this Bible is inscribed by Luis Palau himself. By the way, here's a slideshow of an LPA festival in Buenos Aries, where Cristian lives, which took place in March. 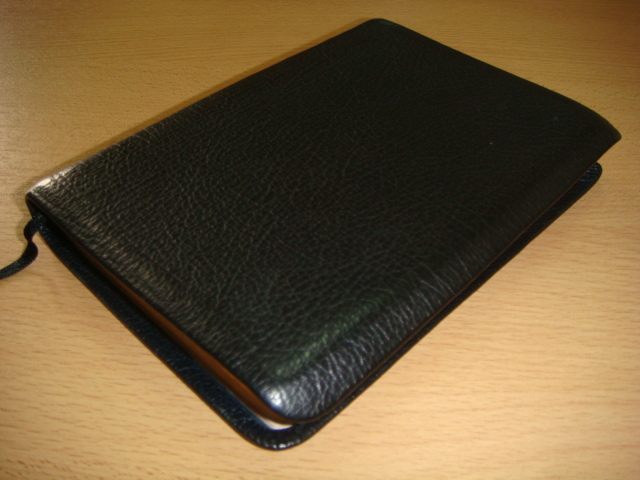 Above: Cristian reports that the calfskin cover is blue, his favorite, though it tends to look black in the photos. This one suggests the true color better. (And it will be obvious in some of the editions we'll be highlighting later.) 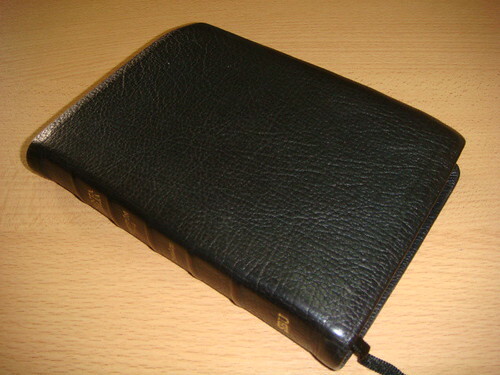 Note how clean that edge looks. Nice work. 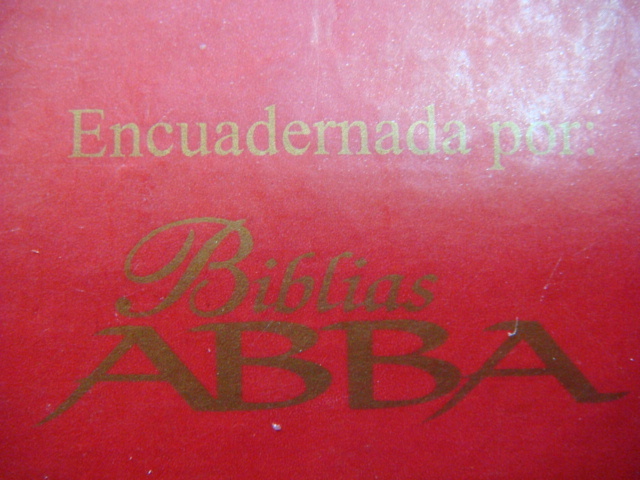 Above: The Biblias Abba Hand Made imprint. Above: Spine detail. 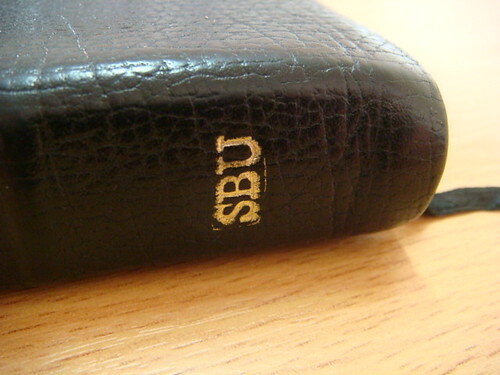 SBU = Sociedades Biblicas Unidas. Above: Closer, with a nice view of the grain. Above: The whole package. 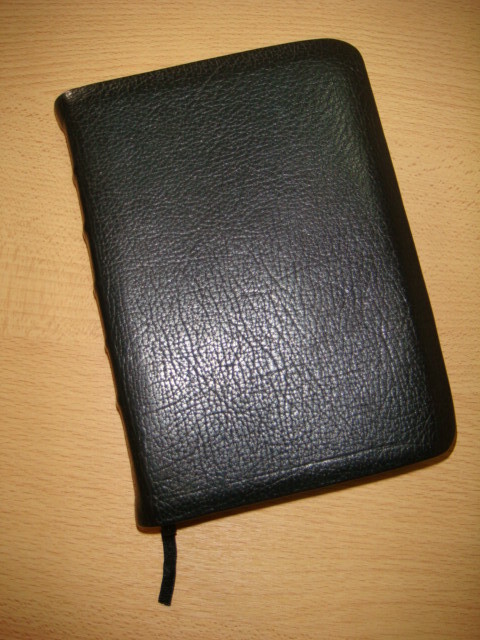 Note how the cover curves around the edges of the text block, giving a rounded off (rather than squared) footprint. Very elegant.